The White Alligator NHRA Pro Stock Motorcycle pictured here is being piloted by reigning NHRA Mello Yello champion, Jerry Savoie. When he’s not racing, Savoie is an alligator farmer in the town of Cut Off, LA. When asked about his chosen professions of Pro Stock Motorcycle Racer and Alligator Farmer Jerry said "They both require quickness. As far as danger, I don’t feel danger in either one." A great article in Cycle News says this about Jerry: "Nobody ever told jerry Savoie that at 51, an age when most racers are well past their prime or retired, that he couldn’t become a competitive rider in the NHRA Pro Stock Motorcycle class. And nobody ever told Savoie that he couldn’t build a privateer team that could not only compete head-to-head with the mighty factory-backed Vance & Hines Harley-Davidson squad, but also beat them at their own game. 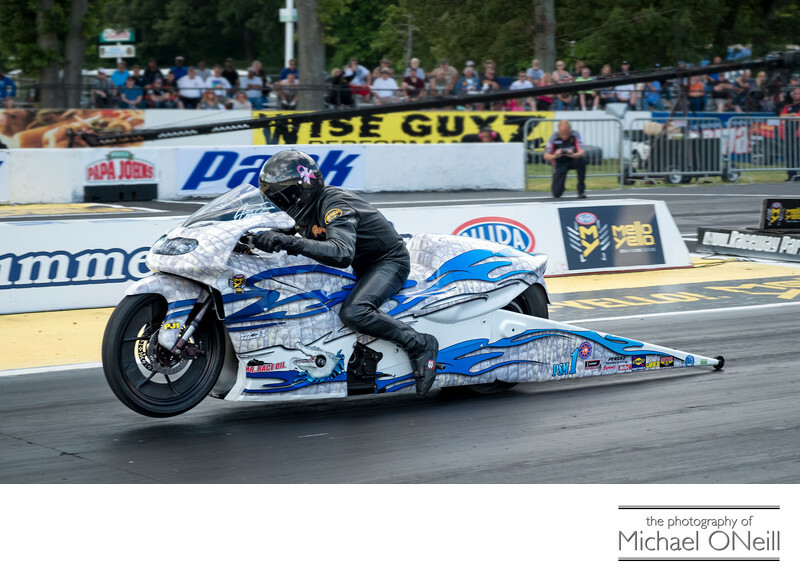 As stubborn as Savoie can be, he probably wouldn’t have listened even if he’d been told all of those things; and that attitude has served him well since the Louisiana-based alligator farmer is now the 2016 NHRA Mello Yello Pro Stock Motorcycle Champion". In my profession as an assignment and editorial photographer in many different type of motorsports I get to see all different types of racing. I have covered sports car racing in The Pirelli World Challenge Series and The IMSA WeatherTech Sports Car Series. Motorcycle racing is still my favorite racing to photograph. My very first trip as a credentialed NHRA photographer was to New England Dragway in Epping, NH. Though I got to photograph everything from Sportsman Class racing to the big three: Top Fuel Dragster, Funny Car and Pro Stock; I was actually on assignment from a major motorcycle magazine publisher and had to zero in on the Top Fuel Harley speed contests that were being held during The New England Nationals. Beyond the drag strip lies my true passion and that is Motorcycle Road Racing. My favorite assignments are the ones that bring me to the road racing courses of such amazing venues as New Hampshire Motor Speedway (NHMS) in Loudon, NH or New Jersey Motorsports Park (NJMP) in Milleville, NJ. I have photographed events in The Championship Cup Series, The Loudon Road Race Series and MotoAmerica. If you are a magazine editor or art director, the owner or sponsor of a race team, or involved in any way in the exciting world of motorsports I’d love to collaborate with you on your next project..